Book now the best shore excursions in Barcelona. High quality and safety at the lowest prices. If your are looking for the best Shore Excursion Barcelona, book now the best guided tours at lowest price with Ancora Tours. Since 2003 we offer you official guides in english, transportation and travel insurance, all included. The highest quality at the lowest rates. Barcelona is one of the busiest ports in Europe, the second largest city in the country and the largest metropolis on the Mediterranean Sea. Admire the work of Gaudì, have a stroll on the Ramblas and visit the ancient part of the city in our shore excursion in Barcelona. What’s eating: Patatas bravas: fried potatoes served with spicy tomato sauce or aioli. Pantomaca: Toasted bread with squashed tomatoes and olive oil. 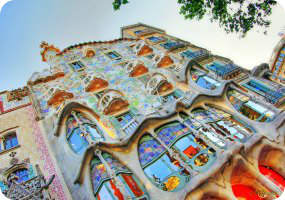 Souvenir: Gaudi reproductions can be found at all souvenir stands. We will start our excursion in Barcelona with a panoramic tour by bus, starting at Montjüic hill where the Olympic Stadium and Poble Espanyol architectural museum are situated. We’ll continue to the MNAC; the museum of Catalan art, and then pass by the Venetian Towers; two copies of the campanile of St. Mark’s Basilica in Venice. Next stop is the Sagrada Familia, Gaudi’s emblematic basilica. Here we’ll have a quick stop to take photos before continuing the artistic path. We’ll drive along the main shopping street Passeig de Gràciato to see more of Gaudi’s creations, including Casa Batllo and Casa Mila, otherwise known as La Pedrera. At Las Ramblas, we can begin our walking tour. We’ll explore the labyrinth streets of the Gothic Quarter as well as the 14th century medieval square Plaça del Rei. At Plaça Sant Jaume, our shore excursion will of course visit Barcelona Cathedral. This Gothic church was constructed mainly in the 14th century and is famous for the gargoyles which adorn the roof. Back on the bus we’ll see Plaza de Colón and its monument to Christopher Columbus. We’ll drive along the Avenida del Paralelo to see Plaça de Espana and Plaça de Cataluña; the place where the old city and the new meet. At the end of the shore excursion, we will return to the port for boarding. NB: for ships with a longer stay, it will be possible for customers to extend the visit to the center on their own, but reaching the port by their own means.